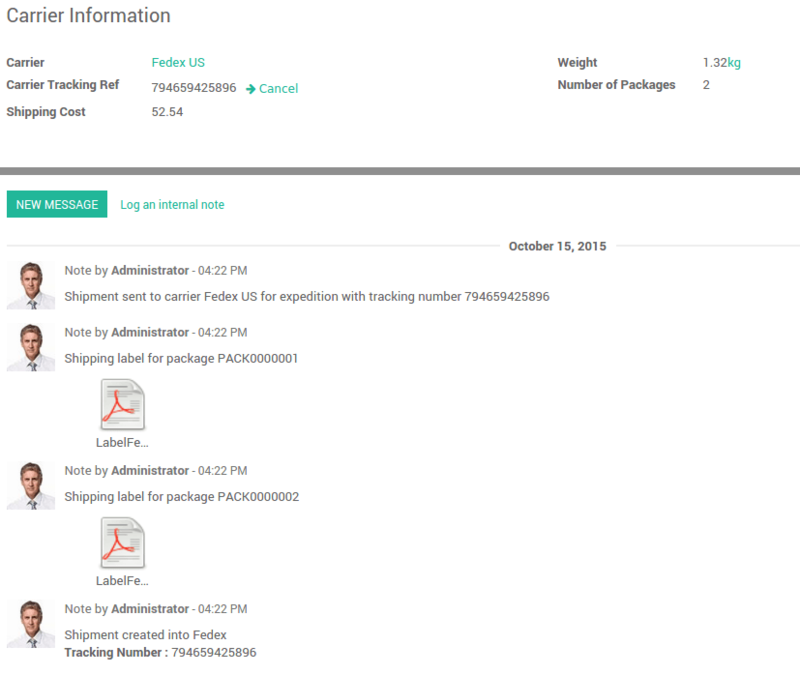 By default, Odoo considers that your delivery is composed of one package. But you can easily ship your deliveries with more than one package. It is fully integrated with the third-party shippers. Click on Apply when you are done. Click on a Delivery Method to choose the right one. The price is computed when you save the sale order or when you click on Set price. The delivery created from the sale order will take the shipping information from it. From here, you can split your delivery into multiple packages. Choose the quantity you want to put in the first pack in the Done column, then click on the link Put in Pack. It will automatically create a pack with the requested quantity. Do the same steps for the other pieces you want to pack in. Click on Validate when you are done. Once the delivery order is validated, you will receive the tracking number. The carrier Tracking ref field will automatically be filled. Click on the Tracking button to check your delivery on the provider website.